14th Dec 2013 - Henry Pipe's first Peal of spliced - 16 methods! 9th Nov 2013 - Peal of 19-Spliced Surprise Major, in memory of Colin Johnson. 16th June 2013 - Dorothy's first Quarter Peal inside, for her birthday! 17th Mar 2013 - QP of 8-Spliced. Engagement compliment to Daisy Davies and Andy Lawson. Rung in remembrance of Jay Futter. Trumpington wins local Striking Competition! 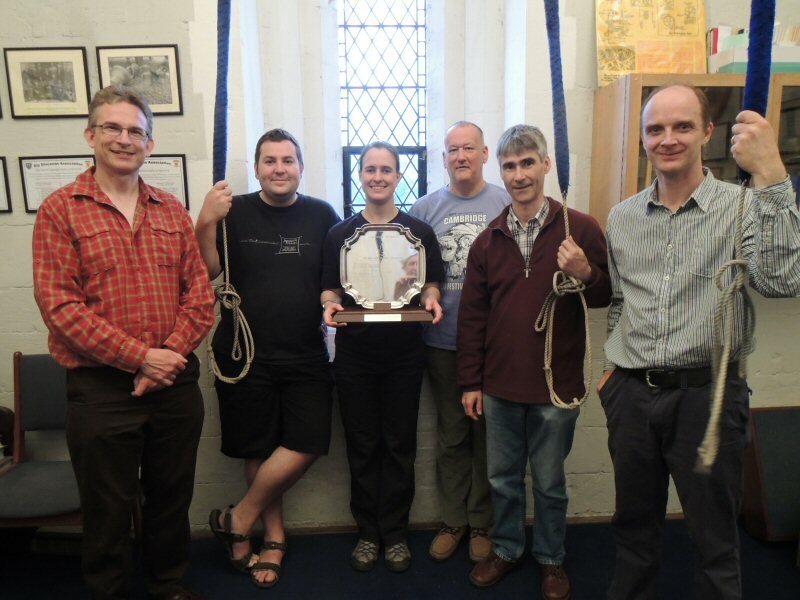 On Saturday 8th June 2013 the Trumpington Bell Ringers took part in the Cambridge District 6-Bell Striking Competition held at Barton. They were delighted to be declared the winners and receive the Ludbrook Plate. This trophy has special significance as it was donated by the Trumpington Ringers in memory of Ivan Ludbrook, former Tower Captain. Sam & Phil organised a fantastic week of ringing, eating, drinking and exploring on Lundy in February 2013. During the week we scored 8 quarter peals, with lots of firsts -including Renee's first QP - but we've never been so cold! Greg has only been ringing for a few months, but under Sam & Phil's tutelage he easily managed a solid performance of ringing tenor behind to his first Quarter Peal on Sunday 20th January at his home tower - congratulations Greg! Mark generated a marvellous Date Touch of 2013 changes of Surprise Major for us, and Robert called it in masterful style on New Year's Day Tues 1st January 2013 to welcome the New Year. The band retired to the Lord Byron as usual for refreshment, and a novel photo opportunity, courtesy of the bar staff.